As a Bostonian I can’t really encourage you to spend JUST ONE DAY in Boston, but if that’s the time you have, then make the most of it! Buy a CharlieTicket or Card – you’ll use this pass for the subway (the T), buses, and the Charlestown Ferry. Begin the day early. Grab a coffee from Dunkin Donuts and head to Long Wharf where you can catch the MBTA ferry to the Charlestown Navy Yard. For a minimum fare you sail through the inner harbor, enjoying views of Boston from the water. Disembark the ferry a short walk from the USS Constitution, “Old Ironsides”, the oldest commissioned warship afloat in the world. Enjoy this national treasure before catching the ferry back to Long Wharf. Or stay on the ferry for a round trip tour of the harbor. A cheap harbor tour! Many people who work in Boston take lunch on the ferry for a peaceful break in the day. Long Wharf and the waterfront: You could spend your whole day in this area. The New England Aquarium is here as are some of Boston’s best restaurants. But we suggest you walk across the street (the Greenway) to Quincy Market, a tourist’s dream of shopping, food, and street entertainers. If you’re visiting with children, you might want to take a spin on the Greenway carousel before enjoying Quincy Market. When you’ve had enough of the tourist scene, use your MBTA pass to jump on the subway. You can walk up the stairs to Government Center T station, or take the Blue line to Government Center. Transfer to any of the Green line Outbound trains. Get off at Copley to enjoy Copley Square, home of the Boston Public Library, the first free library in the US, and the Romanesque Trinity Church. Head one block north to Newbury Street, Boston’s high-end shopping street. There are lots of excellent cafés where you can people watch while you eat. Newbury street ends at the Public Garden. Turn left to enter the garden across from Commonwealth Avenue. Before entering the Garden, take a moment to look down Commonwealth Avenue, the broad avenue of stately brownstones, noting that this area, the Back Bay, is filled land. The land, originally a tidal bay, was constructed by razing most of the original five hills of Boston. Now enter the Public Garden. Here you are greeted by the magnificent statue of George Washington on horseback, designed and built by Thomas Ball, a sculptor from Charlestown. If time is tight, or you’re not much on walking, get off at the Arlington T stop. This brings you to the corner of the Public Garden. You can enter the garden diagonally from the station, but I suggest you walk up a few blocks to enter across from Commonwealth Ave.
Stroll through the Public Garden, enjoying the gorgeous flowers and massive shade tress. If you’ve time, take a ride on Boston’s famous Swanboats. Follow the children from the boats to the duckling statues, Robert McCloskey’s Make Way for Ducklings, immortalized forever by sculptor Nancy Schön. This is the time for you Cheers fans to make a stop at the Cheers bar at 84 Beacon St.
Everyone else, will cross the street to the Common. There isn’t too much to see in the Common so I’d suggest walking along Beacon Street towards the State House. We are ascending Beacon Hill, the last of Boston’s hills. This neighborhood is still the most prestigious in town. To your right, on the Common, you can see the Frog Pond, where kids splash in the summer and skate in the winter. When you reach the State house, take a minute to reflect on the Robert Gould Shaw and Massachusetts 54th Regiment Memorial. The Massachusetts 54th was among the first regiments of African Americans allowed to fight in the Civil War. Turn right and follow the park downhill to the Corner of Tremont and Park. Here you’ll find the narrow red brick line for Boston’s Freedom Trail. Follow the trail past the Park Street Church, the Granary Burial Ground (find Mother Goose’s headstone! ), Kings Chapel, the Old State House, and will arrive back at Faneuil Hall and Quincy Market, close to where we started the day. Break for ice cream or a lobster roll. The Freedom Trail continues into the North End. Still not tired? Tour Paul Revere’s house, the Old North Church and climb to the top of Copp’s Hill where you’ll see the historic burial ground AND the narrowest house in Boston. For most of us, that’s more than enough touring for one day so to any of the fabulous restaurants in the North End. Pick up a pastry at Mike’s before calling it a day. If someone in your party isn’t able to walk this tour, we recommend Old Town Trolley Hop On Hop Off tours. The children’s classic of mallards in Boston’s Public Garden. 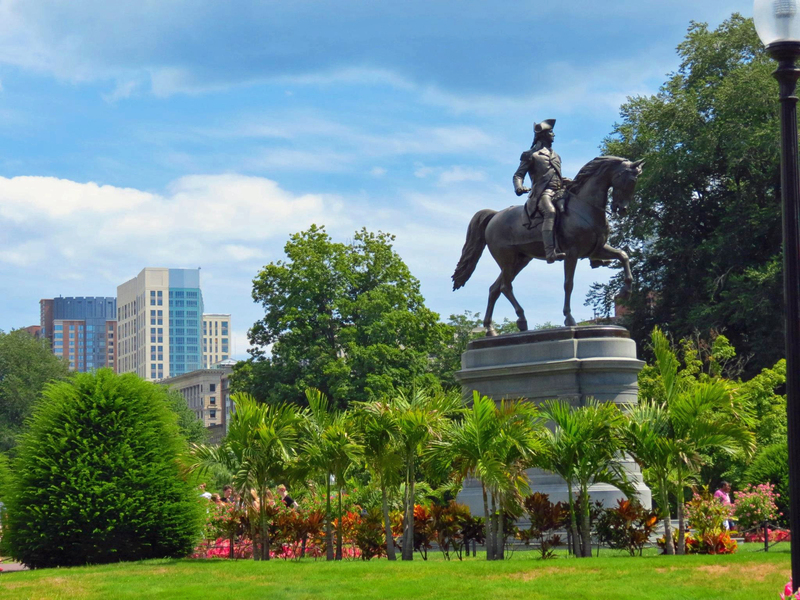 Posted on March 14, 2019 March 15, 2019 by TravelingTullsPosted in New England, North AmericaTagged Boston, city guide, Massachusetts, walking tour.